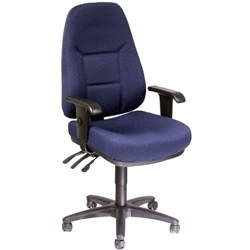 Features: High back Semi Executive chair with adjustable arms. Colours: Black, Navy and Charcoal Fabric. Action: 3 Lever Full Ergo action with seat slider for variation in seat depth. Load Test: Factory tested to 180KG. Also available in a medium back.